Barabarca: A sheltered bay with a sandy beach surrounded by Mediterranean forest, about 100 metres from the transparent, emerald open water stretching out towards the west and the peninsula of Capo Stella (Capoliveri). 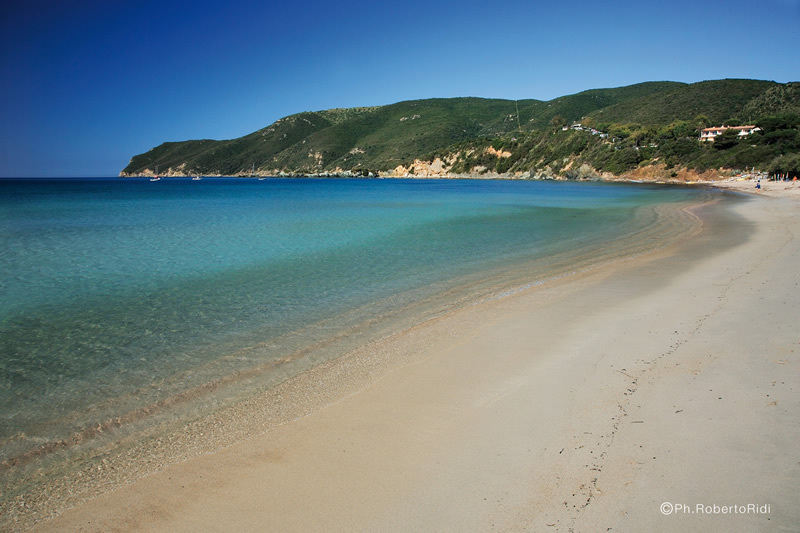 Cavoli: One of the most renowned beaches on Elba because of its beauty, transparent water and granular beach, about 300 metres long, with a base of white granitic large-grain sand and rocky deposits in some areas. Its name derives from “cavili”, which were square blocks of granite that were at one time extracted from the caves in the area. There are still signs of granite carving above Cavoli, which was ongoing from Roman times right up to the Medieval period, by the inhabitants of Pisa. It is an ideal place for youngsters and those who want to have fun and get the perfect suntan. Colle Palombaia: Colle Palombaia is a suggestive and wild beach, not far from Marina di Campo, and is ideal for relaxing away from the masses. The beach is very peaceful even in the busiest parts of the high season. 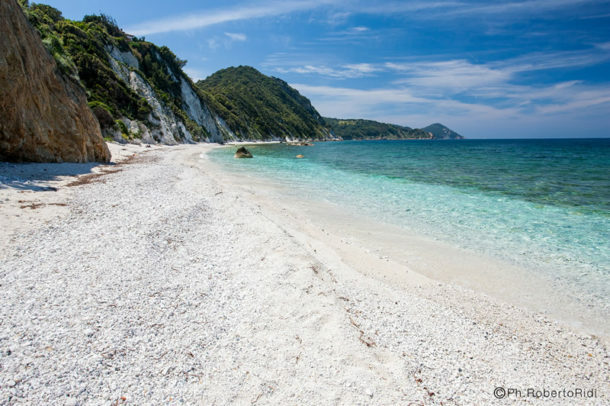 Felciaio: The sand and gravel beach at Felciaio is much appreciated by those who want to relax and do some diving (Capoliveri). Fonza: The beach at Fonza is near Marina di Campo and access for dogs is allowed. The sea bed is sandy and gently sloping. 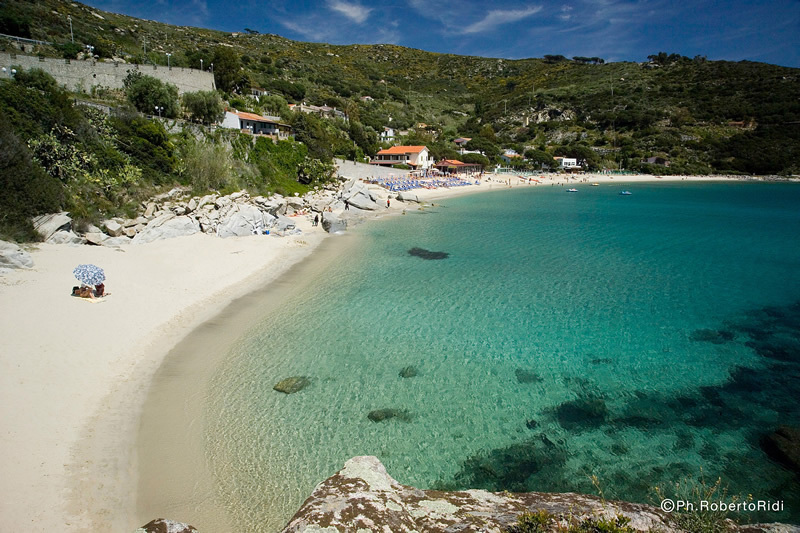 Innamorata: The beach of Innamorata, set in a romantic sandy bay, offers clear water and suggestive sunsets (Capoliveri). Lacona: The beach at Lacona is one of the largest on Elba, composed of dunes of very fine sand, a real ecosystem of great beauty, 1,160 metres long, located on the deepest gulf on the island, with beautiful light sand and the centre of a large area equipped with tourist facilities of all sorts and levels (Capoliveri). Laconella: An attractive beach of fine sand set between the promontory of Punta della Contessa and Capo Fonza (Capoliveri). Lido di Capoliveri: A long, sandy beach, much frequented by younger people, well connected by a bus service. Madonna delle Grazie: A very small sand and gravel beach, offering good diving facilities and a restaurant/bar (Capoliveri). Margidore: A very large beach, but peaceful and easily accessible, also by the disabled. There are bars and canoes and surfboards can be hired (Capoliveri). 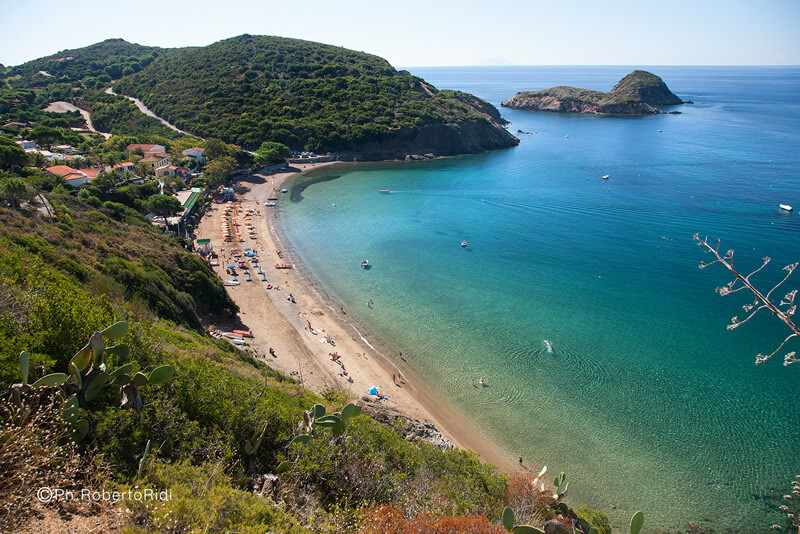 Marina di Campo: A fine sand beach and the longest beach on the island next to the town, with plenty of facilities and swimming equipment; one of the best locations for children. 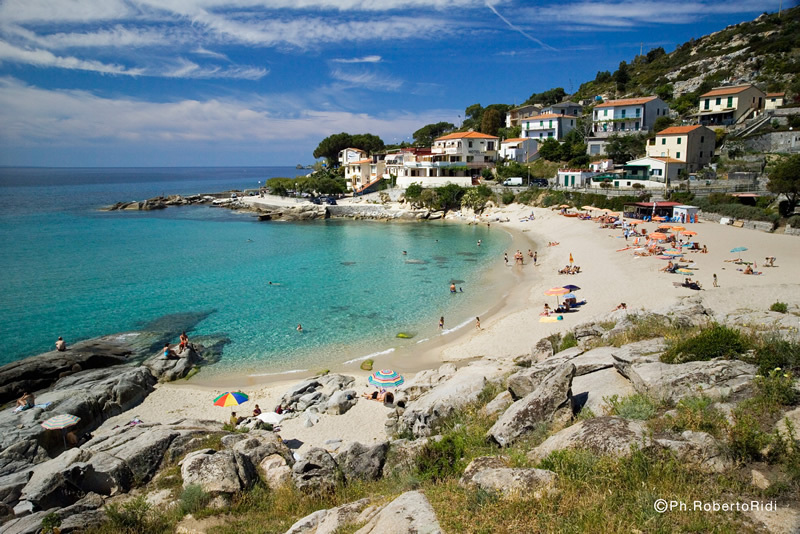 Morcone: A small beach near the centre of Capoliveri, offering plenty of facilities despite its size. The beach provides a wide view of the horizon, where the sunset highlights the profiles of the promontories on the southern coast of the island (Capoliveri). 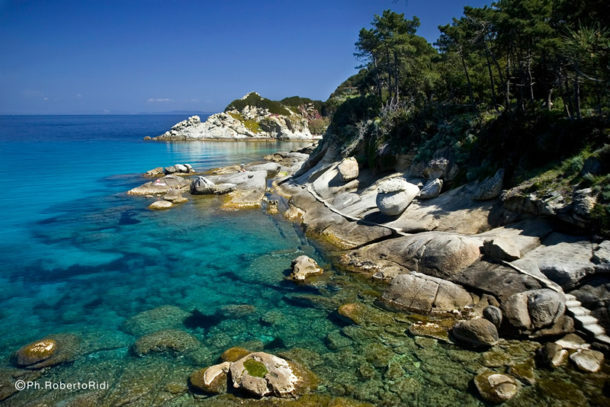 Norsi: is a long sand and gravel beach near Capoliveri, which is easily accessible bay and suitable for children. Pareti: A sandy beach near the centre of Capoliveri, surrounded by Mediterranean forest. This beach was used as a base by the freediving record holder J. Mayol. 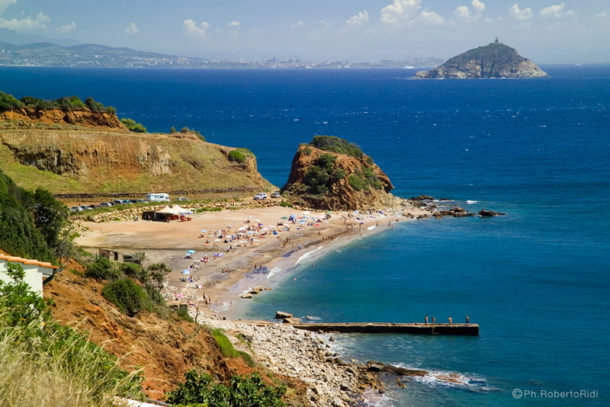 Seccheto: An easily accessible and peaceful granular sand beach surrounded by beautiful rocky shorelines and 150 metres long, located to the left of the rocky deposits which form natural swimming pools for children. The sea bed is sandy and the water extremely clear. There are no facilities on the beach apart from a bar which hires out umbrellas and sunbeds. Seccheto is an ideal location for those wanting some peace and quiet (Marina di Campo). Zuccale: A fine sand and rock beach with crystalline water and superb sunsets, located on one of the most attractive stretches of the Calamita peninsula.